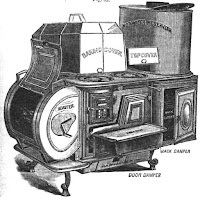 "Horse trading is not to be compared to it" was how an 1888 article in a trade journal described closing the deal on a new stove where dealers were forced to buy the old one. Which to buy... each family member wants something different. Yearly new features and "the neighbors' stoves are brought up for comparison." 1630s thin "wafer biscuits" (left), "Fine French Wafers", "gaufres Cigarettes," Cornet (cone) or Horn Gaufres were baked in thin wafer irons and eaten flat or rolled.